There are many stages on way of tea. Each person is different, but many of us experience similar course. Lately, I have started to miss some order. I feel envy, when my friend explain how he drink puehrcha: "I usually open my tea closet, choose one cake, toucha or brick, which seems to nice to me at that moment. Then I drink it for weeks till I finish it". It sounds a bit orthodox yet simple and clean. Another tea chum just told me that for last month he drunk just teas from 2002. He have realized that he have many of them so he took a chance to get to know the year better. I also find out, that sometime just a sample of tea is not enough or it is completely misleading. 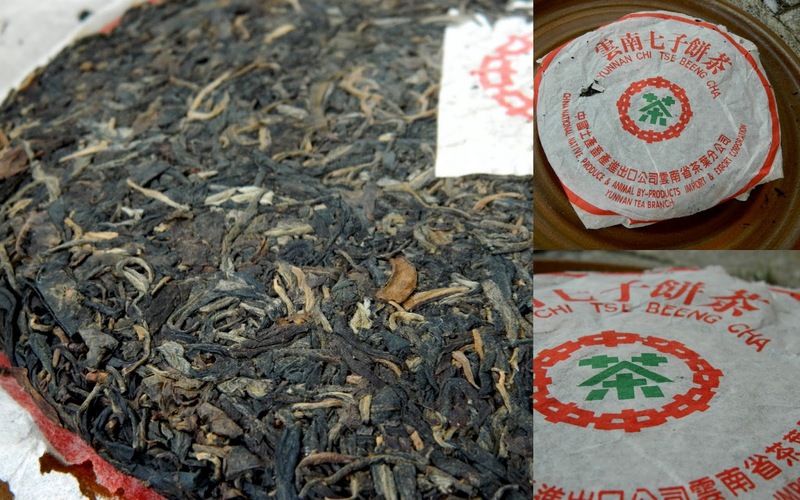 If one would like to judge a tea or learn about particular tea recipe, storage, factory or mountain then 10g of leaves is, very often, woefully not enough. Sometime you have to go through the cake to get to know it. What helped me, to go from words into an action, was also reading this Hster post. As first, I have chosen this traditional cake. It is Menghai 7542 from 2003. I chose this one for several reasons. First of all, I like it, it is nearly ten years old now and very pleasant to drink - you almost can't destroy the brew. Actually it very good! 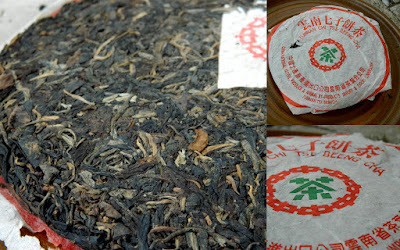 It was lightly traditionally stored and has stayed in HongKong for nine years. You can see it on leaves. I went for this cake also because I have few of them (I got lucky) so I am not going to cry so loud, when the beeng will be finished. So now, I drink it every morning, every day. Depending on chosen pot, I use from 5 to 10g of leaves. Brew it in many ways. More ceremonially or more casually depending on free time and mood. Sometime I finish it during morning, sometime I am getting back to it whole day. More then 100g of it is already missing. Now I start to get to know it. It is pleasure. If I will keep going (I am not going to drink it if the pleasure disappear) the cake should be consumed in around 40days. I will let you know, that is for sure. How do you drink you teas? Do you focus on one tea for while or are you jumping from cake to cake, from bag to bag? Thanks for sharing! And at the end, just for a fun, three pictures from today morning. They are not manipulated in any software- just my camera has focused this way. Two new pieces for my Gem collection have been fired during cold days of November. Before I will introduce them, please let me say goodbay to my first two Gems. I am keeping my word. Gem number one, frozen Waterfall, and Gem number two, Thaw pond are going to be replaced by new pieces. Both Gems were reserved very quickly after releasing. Now, they are going to fly to their new homes - The teapot to Shanghai the tea caddy then to Berlin. Big thanks to those new owners, tea lovers, for their support. Enjoy! There was several questions about "how to reserve Gems" or "which ones are still open for reservation". To make is simple, I have labeled all reserved pieces in Ten Gems picasa album as "reserved". If you are interested in any new Gem and you are willing to wait for about ten months, then just let me know via email. If you are going to be the first applicant then it can be yours. So far, the whole Ten Gems of Ten Kilns project works pretty well. To look back, at those few months in shape of teaware, is interesting and inspirational. I feel satisfaction as well as I can see imperfections and possible ways of refinement. It is good! When some of my work has been sold I very rarerly browse through and study pictures of it. But when I have it here, sitting on my shelves then I hold it in my hands time to time and I can judge it from new perspective. So the collection must go on! For more pictures of this new piece please visit this page. If this "Ten Gem of Ten Kilns" project is new for you please read this post first.